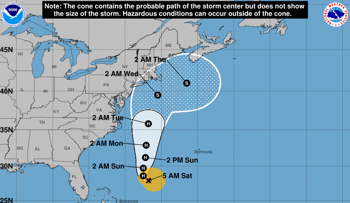 ContactRelief recommends suspended contact with portions of eastern Massachusetts and Rhode Island dues to Tropical Storm Warnings from Hurricane Jose. ContactRelief recommends resuming contact with many additional Florida counties except for specified zip codes. 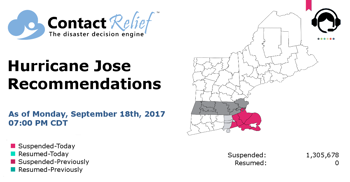 ContactRelief recommends resuming contact with certain Florida counties and all areas of Georgia and South Carolina. "Tropical storms watches may be raised for North Carolina later today", says National Hurricane Center in its latest advisory. ContactRelief recommends continued contact suspensions for Puerto Rico, the U.S. Virgin Islands, most of Florida, and specified zip codes in Georgia and South Carolina. ContactRelief recommends resuming contact with all counties in Georgia and South Carolina except for specified zip codes. 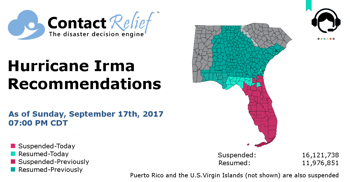 ContactRelief recommends resuming contact with additional Georgia and South Carolina counties and some counties in the western panhandle of Florida. ContactRelief recommends resuming contact with all Alabama counties and some Georgia and South Carolina counties. 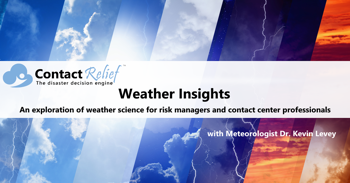 ContactRelief Meteorologist Dr. Kevin Levey examines Hurricane Irma.